I had seen a cool looking cape at gymnastics practice a while back. I talked to the mom, and she said her teacher had made the whole class a cape at school. And it looked easy. I’m talking: e.a.s.y. That’s my kind of project. It took me a long time to buy the $3 shirt, but after I did that, it took about 2 minutes to complete. I didn’t add any embellishments to it. It was immediately taken and used since then. Now I have a new addition to the family. 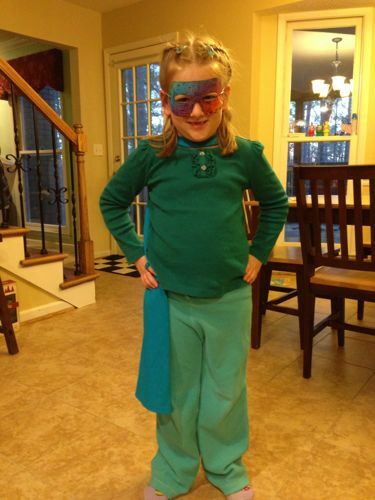 Super Blue Girl to the rescue! I made Ellie one too. But Rapunzel doesn’t wear capes.